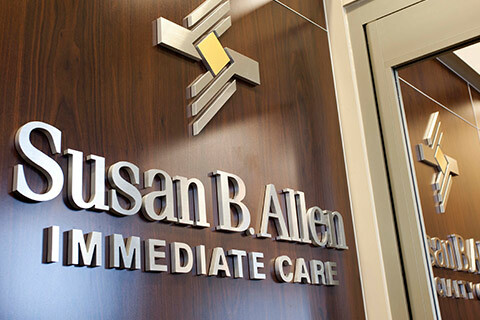 When longtime client Susan B. Allen Memorial Hospital was looking to expand its footprint to neighboring Augusta, KS, Health Facilities Group furnished a unique design for the Susan B. Allen Immediate Care and Clinic - Augusta. SBA Memorial Hospital developed an economic model for SBA Immediate Care and Clinic - Augusta in which the clinic's immediate/urgent care unit would connect patients in need of further services with the main El Dorado campus of SBA Memorial Hospital. This connection is particularly valuable because the city of Augusta is roughly equidistant to the El Dorado-based SBA Memorial Hospital and the closest of the Wichita metro area’s many health systems. By being the first to provide care to the community of Augusta, SBA Immediate Care and Clinic - Augusta increases the likelihood that patients will choose to continue care in El Dorado. In order to build trust between patients and the entire Susan B. Allen health system, HFG's design for SBA Immediate Care and Clinic - Augusta emphasized not only functional utility but also attention to the finest of details. From unique stonework to elegant flooring, SBA Immediate Care and Clinic - Augusta invites visitors to consider the entire Susan B. Allen network. Health Facilities Group provided architectural services to Susan B. Allen Memorial Hospital for its new 7,000 SF immediate care and clinic in Augusta, KS. The clinic features a new immediate care and specialty clinic, including diagnostic X-ray services and lab services. The clinic also houses a family practice from which residents of the Augusta area can receive routine medical care. The facility was designed for future expansion as healthcare and community needs evolve. Key services supplied by HFG include healthcare planning, space evaluation & programming, state-of-the-art medical design, economic analysis, estimating services, and construction phasing.